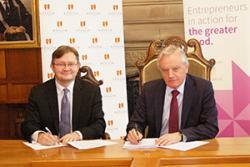 Andrew Bacon, Chief Executive of Enactus UK and Professor John G Hughes, Bangor University Vice-Chancellor sign the agreement.Bangor University is pleased to announce that it has joined the world-wide Enactus organisation by signing up to the Enactus UK programme. 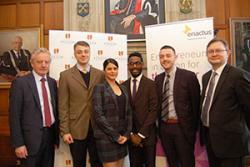 “Enactus plays very much to the strengths of Bangor University” said Vice-Chancellor Professor John G Hughes. “The reaction we have received from students has been amazing” said Aaron John, the student leader of the newly established Enactus Bangor team. Vice- Chancellor Prof John G Hughes and Andrew Bacon, Chief Executive of Enactus UK with Bangor University's Enactus Committee members. Enactus is an international non-profit organization dedicated to inspiring students to improve the world through entrepreneurial action. It provides a platform for teams of outstanding university students to create community development projects that put people’s own ingenuity and talents at the centre of improving their livelihoods. Guided by educators and supported by business leaders, students take the kind of entrepreneurial approach that empowers people to be a part of their own success. The projects undertaken have the potential to transform both the lives of the communities that are served, and in turn, the lives of students as they develop into more effective, values-driven leaders. “We are delighted to welcome Bangor University as a member of Enactus UK” said Andrew Bacon, Chief Executive of Enactus UK. “We are particularly impressed with the enthusiasm shown by the student leaders and by the great many students who have become involved in such a short time. This augurs well for the success of Enactus Bangor”. In the UK, over 2,800 university students are involved in designing and running a range of social entrepreneurship projects which directly impact on the lives of almost 60,000 people in the UK and in developing countries. Last year, in Johannesburg, the student team from University of Southampton won the Enactus World Cup competition, in which 1700 universities from 36 countries were competing. Their projects seek to provide long-term solutions to problems of sanitation, water quality, entrepreneurship and education in Kenya.